Papermoon Bankside Split Neck Tunic I really love this! It's different than anything else I own! Super comfortable & a little boho. Would also be adorable with some black shorts. I have a thing for gray sweaters; therefore, I own far too many gray sweaters. This poncho style makes it a little more unique. It's a bit more lightweight than I was hoping for, but I still love it. I also have a thing for cowl necks, so maybe this needs to be in my closet! I'm obsessed with these colors! That pop of orangey/red is beautiful. Again this is somewhat lightweight (I tend to like heavier sweaters), but the poncho style is adorable! When I first pulled this piece from the box, I thought "woof." But then I put it on, & I actually love the style. It fit like a glove & was still ridiculously comfortable! However, the floral print is far too busy for my taste. Plus, I can't nurse in this dress so I would never wear it. Sending this back. A few things to note here... You are probably wondering where my 5th item is... Well, it was so hideous that it literally wasn't even worth the effort of taking pictures in. It was really that bad. Also, even though I need clothes that are nursing friendly, I did not tell my stylist that. I can make almost any clothing nursing friendly if I need to, so I didn't want to leave that in the hands of my stylist and potentially miss out on something. Overall, I was really happy with this fix! So tell me...what shall I keep?! 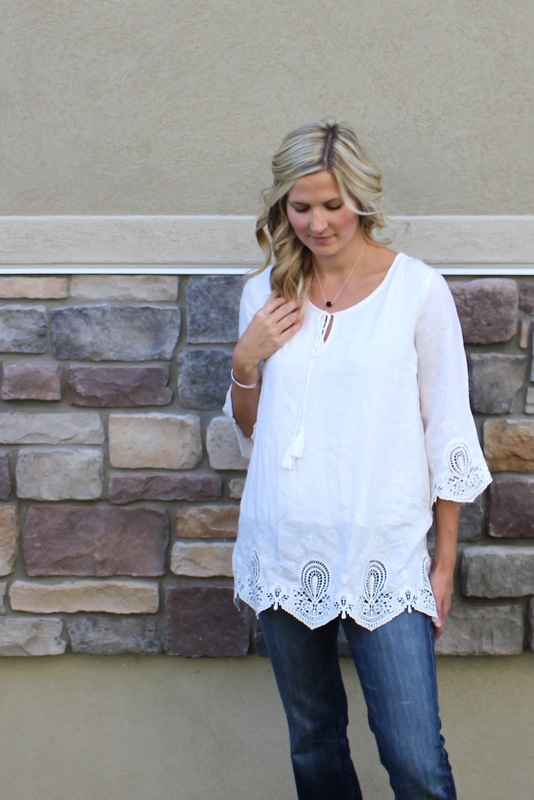 And if you have yet to try Stitch Fix, do it! At least give it a try once! Waiting for your package to arrive is far more exciting than you would ever believe, and then....fashion show!!! Everything looks great on you, but I vote for keeping the poncho cardigan! If I were you I'd keep the first white blouse. I also love the gray cowl neck poncho, but o think you are more likely to find something similar at a regular store on sale. The white blouse is unique and I think you'll wear it a lot. But you can't go wrong with any of the first three. That dress fits you great, but I agree the print is a little too loud, so unless you had an event to wear it to where you wouldn't nurse, you'd never wear it! I vote cardigan--- easy to throw on and look put together! I like the grey cowl neck too, but it sounds like you have similar sweaters. I like the white shirt, but looks kind of summery and fall is coming!!! Unfortunately the sweaters are really too light for our colder Falls, so I decided to keep the white top! It also makes the most adorable swim suit cover up! I love that I can wear it now! I think I'd go for the gray poncho! It's perfect for fall and looks so comfy! My vote is for the first white top and the cardigan - the white top is SO flattering on you! 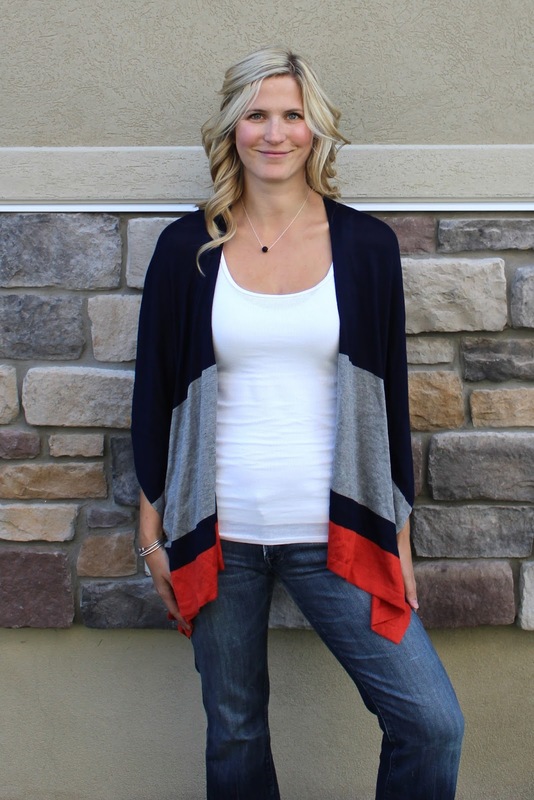 I love love that cardigan and think it'll be a great layering piece for you! All three are adorable, but my vote is the white blouse – you look great! Some great items, and you look wonderful in them! I love that gray poncho for early fall and winter. Also, that white top is very relaxed, but chic. My vote is for the first white top. Can't go wrong with a classic white shirt. Looks so nice! The others are nice too, but I think they are more casual and if you're anything like me, you wear casual enough, so it's worth splurging on a few nicer pieces to have when you need something a step up! My thoughts exactly; I went with the white top! I went with the white top! And I so surprised they still haven't ventured into Canada...I'm sure it's inevitable! And super bummer about the dress because I love it and lovvvvvve how it looks on you! Hot momma!! I seriously think you look incredible! My favorite is that first white top! It's so versatile! You could do black leggings, etc! And you would be able to wear it year 'round! Loooove th first top, it's perfect! Love the grey poncho! The white top is fun too. I think I need to try a fix to get me through till I can loose some more of this pp tummy! Love the first top and the poncho cardigan. And seriously, you are looking good in that fitted dress momma! :) I finally gave in and my first fix is coming at the end of next week. I can't wait! I also didn't mention nursing because I feel the same way. Besides a dress like that one, I can pretty much make anything work and even a dress like that I probably would wear to a wedding or special date and could probably change in time to nurse/pump. oooh sorry if i'm late but that first blouse is gorgeous and totally suits you! Like you went with that one :) you look fantastic for just having a baby!! I hope I can look that great in a few months too!! Oh thanks Emily! I feel pretty great most of the time, but hips & tummy still feel a bit big. That's where the remaining 7 lbs is hanging out! OMG that dress is adorable on you. You need to find a reason to keep it. I cant find it online anywhere, can you link it? Stitch Fix items are usually hard to find anywhere else, and there is no way for me to link to it...sorry! Your best option would be to get a "fix" and pin that dress, emphasizing that you want it. In case you are wondering it was $138. I like the first three, and the dress too but not nurse friendly will definitely be in the back of the closet getting no use. I think I'd go with the grey sweater, but the cardigan is a close second. Definitely keep the first three items!!! Love them all! I want those in my next fix! Hope you kept the white!! The cardigan is cute too!